Debian’s aptitude command is, according to their documentation, the preferred program for package management. I use Ubuntu for my work machine and servers and have found aptitude to be easy to understand and use, as well as reliable. Unlike apt-get, aptitude offers a full-screen (or full-window more likely) mode that can be used to interactively manage packages on a Debian or Ubuntu system. As is often the case, a combination of command line operation and an interactive utility prove to be very attractive and useful. 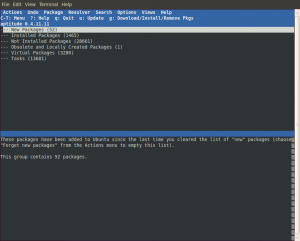 You might use command line mode most often, to install, remove and upgrade packages, and sometimes use the interactive mode to check the status of your system and mark packages to manage how particular packages are dealt with. note: You do not need to sudo aptitude because, in interactive mode, it will prompt you and run sudo itself, if needed. Oh, the convenience! The interactive interface includes drop-down menus at the top of the display. These are accessed with control-r or F10. Many of the of the commands available have a shortcut command key available, listed on the right side of the menu choice. 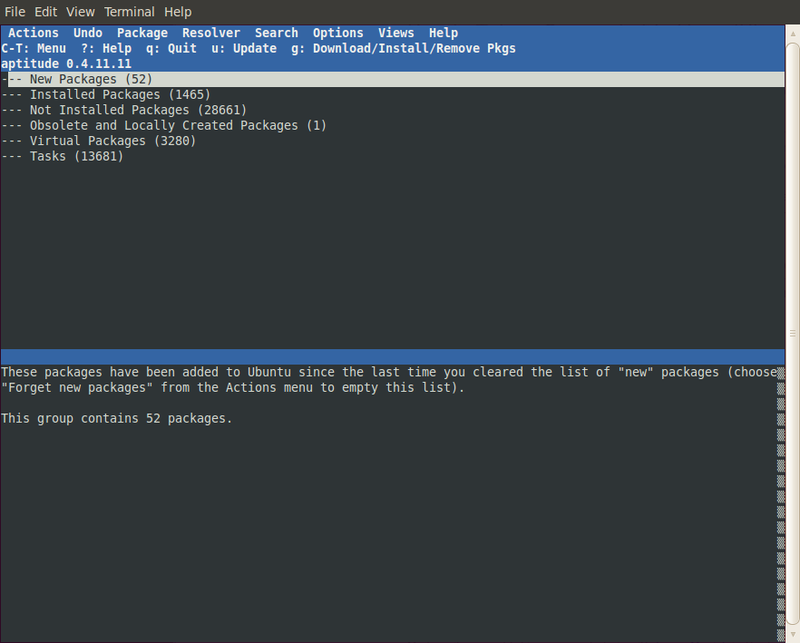 New packages Packages that have been added since the list of new packages has been cleared (with the f command). Installed packages Packages that are installed on the computer. Not installed packages Packages that are not installed on the computer. Obsolete and locally created packages Packages that are installed on the computer, but not available from an apt source. 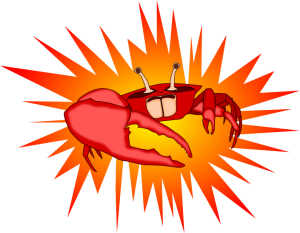 Virtual packages Pseudonymous for other packages for compatibility or convenience. Tasks Groups of packages that offer an easy means to install groups of packages for some purpose. While the user interface is pretty well designed, it can be tricky to use because a variety of single letter codes are displayed and commands are entered via arcane single letter commands. * The q command quits the current operation and goes back to the previous mode. When at the top level, the q command quits the program. In general, the g goes forward and the q goes back. Press g twice? Yes, the first time results in a list of packages that will be processed and the second time completes the action. This gives you a chance to review the changes before proceeding. If you’ve erred, you can select ‘Cancel pending actions’ in the ‘Actions’ menu. a explicitly accepts an action (press it again to un-accept). r rejects a pending action. g again goes ahead with pending actions. Use control-t for the drop-down menu to see all available actions. All of these commands are found in the Actions drop-down menu. These commands are found in the Package drop-down menu. These flags appear in the first column of a table of packages when you’ve drilled down in one of the categories. i Package is installed and all its dependencies are satisfied. c Package was removed, but its configuration files are still present. p Package and all its configuration files were removed, or the package was never installed. B Package has broken dependencies. u Package has been unpacked but not configured. C Half-configured: the package’s configuration was interrupted. H Half-installed: the package’s installation was interrupted. 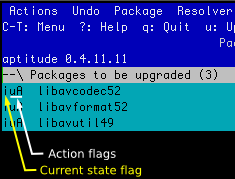 These flags appear right after the current state flag in column one of displayed packages when you’ve given a command to make an alteration. One or more action flags will appear. i Package will be installed. u Package will be upgraded. d Package will be deleted: it will be removed, but its configuration files will remain on the system. p Package will be purged: it and its configuration files will be removed. h Package will be held back: it will be kept at its current version, even if a newer version becomes available, until the hold is cancelled. F An upgrade of the package has been forbidden. r Package will be reinstalled. B Package is broken: some of its dependencies will not be satisfied. aptitude will not allow you to install, remove, or upgrade anything while you have broken packages. 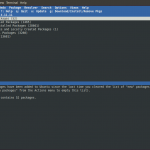 One of the many attractive features of Ubuntu and Debian Linux is the package management system. Coming from other operating systems and other distributions makes the discovery of the Advanced Packaging Tool, APT, a source of pleasure and delight. Here is a system that solves dependency hell, makes keeping soft up to date easy and facilitates simple installation and removal of software packages. The mainstay of this system has been apt-get, an extremely useful and versatile program that has been the heart of the Debian APT system. A great and useful program, but not perfect, the newer program aptitude is the result of an effort to improve on apt-get. In addition to a cleaner command line interface, aptitude offers a fullscreen character-based UI and more complete tracking of what has been installed and interdependencies. These two programs provides higher level capabilities compared to dpkg, the Debian low-level package management utility. They offer an interface to package repositories and provide relief from dependency hell. As you can see, in addition to a more complete dependency tracking solution, aptitude also provides a (well designed) full-screen interface and cleaned-up command line syntax. Also, contrary to reports elsewhere, aptitude offers the ever important super cow functionality, with sarcasm added (Easter egg). When installing a package, aptitude will show which other packages, though not required, are recommended or suggested, so you can decide whether or not to also install those. Because aptitude more completely track dependencies, if you use it exclusively your will not need to use deborphan or debfoster. Apt-get does not remove packages it installed as dependencies when the package you specified to be installed is removed. Aptitude does remove unneeded dependencies. This basic difference can cause problems when switching from apt-get to aptitude. Use one or the other. I’ve switched completely from using apt-get to using aptitude. If you do use apt-get, afterward run aptitude and fix any problems detected by first pressing g, which will show broken dependencies and packages that aptitude would remove. 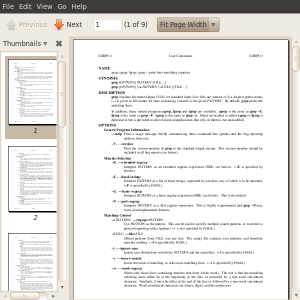 If you want to retain the packages that would be removed, arrow down to the header of that category and press the + key. Pressing g again will update your system with your indicated changes. This will cause aptitude to retain all current packages going forward. As displayed in the comparison table, aptitude offers a character-based full-screen interactive user interface if aptitude is entered as a command with no options. The interface is very well designed and implemented, logical and easy to use after a few minutes of examination and trial. It has a drop-down menu system, which I found to work well using a mouse. The help system can be access via the drop-down menu or by pressing the ‘?’ key. A plethora of options are presented, most of which will make sense from what you’ve seen in the command line operation of the program. Pressing ‘q’ exits help…indeed pressing ‘q’ is the way to exit other modes in the program and exiting the program itself. I’ve found aptitude to be so well done, that I use it for all my package management needs. I use Synaptic to help search for software sometimes, whether for my local machine or a server. Then, I install it with aptitude…in any case Synaptic would be pretty useless over SSH to a server. 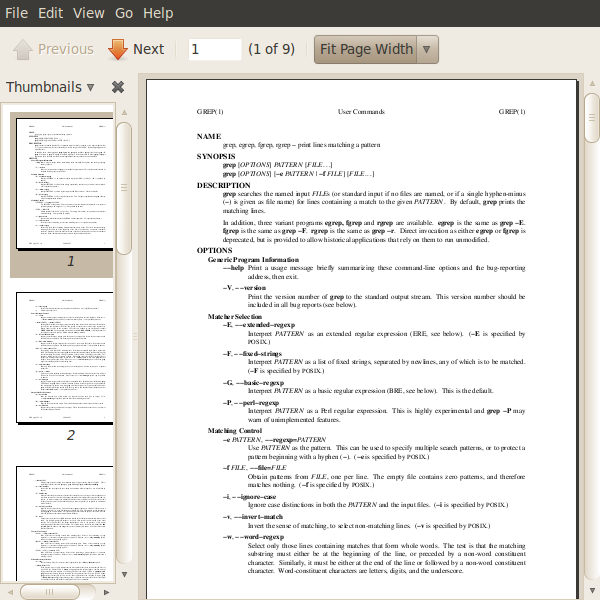 Some pages I found helpful: http://pthree.org/2007/08/12/aptitude-vs-apt-get/ and http://www.garfieldtech.com/blog/your-debian-aptitude. This post is directed at Ubuntu and Debian server admins. As all work and no play makes Jack a dull boy, it is imperative that you immediately make your server more fun. If you do not get a little smile when you log into your server via SSH, then something is terribly wrong! Avoid dullness by all means. Here I will show how to add and use figlet, fortune, cowsay and xmlstarlet to have big banners, random quotes’n’quips, talking cows and word of the day appear when using SSH to access your server. Fortune is a simple program that displays a random message from a database of quotations. Cowsay is a filter that takes text and displays a cow saying it. First, make a backup of the original /etc/apt/sources.list file. Bingo, whenever a user logs into the media2 server then will see your nifty banner! A little dullness have been bannished. These are the commands we’ll be using to offer some fresh content on every login. Modify the /etc/bash.bashrc file. This affects all users that use bash as their default shell. 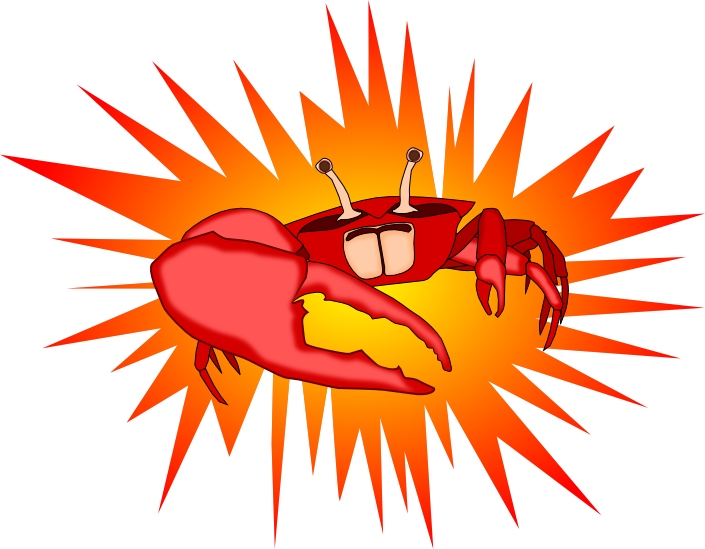 echo -n "word of the day: "
/usr/bin/xmlstarlet sel --net -t -m "/rss/channel/item/description" -v "." "http://dictionary.reference.com/wordoftheday/wotd.rss"
The fortune command pops out a random quip, piped into cowsay, which is configured here with -f to use a random character graphic image. Then, word of the day is sourced from an RSS feed with xmlstarlet. word of the day: sesquipedalianism: given to using long words. 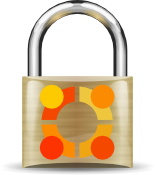 Implementing a basic firewall on your Ubuntu server is simple. UFW (Uncomplicated Firewall) is a simple configurator for Netfilter, the packet filtering system that is built into the Linux kernel. This will then filter IP packets that arrive at the server by port number. Port numbers are nothing magical, just an integer in the packet header that gets mapped to a service, like your web server. All the packets arriving with a certain port number are mapped to a service. By default, when you turn on UFW, everything is filtered. Then, with very simple commands, you set rules to allow just the services you are providing. If you are just providing a web server, you would allow only the port needed for that. That is all there is to it. UFW is now running. When your system reboots, UFW will be started automatically. By default, SSH uses port 22. Of course, you can configure OpenSSH to use a different port number…then open that port instead of 22. The concept to retain is that rules can be set with a port number (22) or service name (ssh) or application name (OpenSSH). By default, HTTP severs use port 80. The /etc/services (text) file is used to map service names to port numbers. This can be used to find out which ports are mapped to which services. The vast majority of the designations in this file are not implemented on a given system. This file’s main purpose is to allow service applications (programs) to get the port number to use for a service being provided.